Presenting Erin de Burca and Holly Rees. Featuring in their first exhibition at GX Gallery, Erin de Burca and Holly Rees show works inspired by urban and rural landscapes. Both artists are interested in the effect these environments have on human interaction and understanding of place. 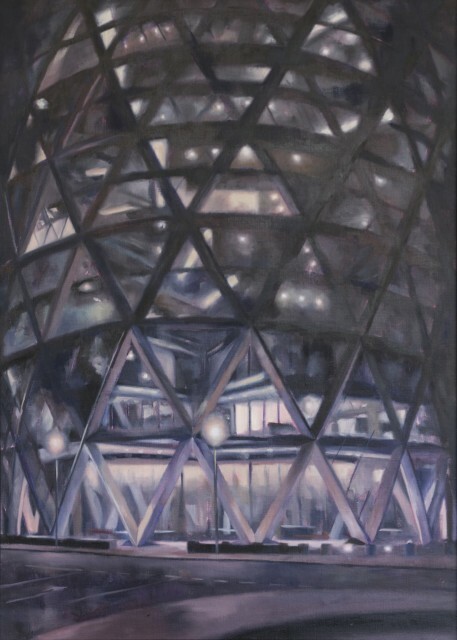 Erin de Burca’s explores architecture and the urban environment, provoking the viewer to consider how they affect and reflect their personal and social experience. De Burca grew up in Ireland, moving frequently, but always finding her surroundings to be monotonous. From this she developed a keen interest in architecture and how it affects humans, as well as their interactions (or lack of) with each other. Holly Rees uses painting to examine the ways in which we experience and understand landscape. Intermediates (such as windows, screens, postcards etc.) can cause a potentially problematic understanding of the world around us and create an image of “nature” as something separate from humanity. She is interested in questioning whether our experiences through different intermediaries reinforce a romanticised idea of nature, or give something of a false understanding.